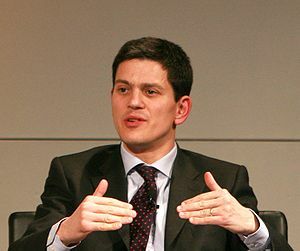 David Miliband will receive a special award for outstanding achievement in “biting your own tongue” at this year’s TV BAFTAs, organisers have announced. David’s contribution, to the long running duologue “My Idiot Brother”, has often been over-looked by the critics. While Ed has gained plaudits for his pratfalls and gurning to camera; it is straight-man, David, who has brought a tragic subtext to life. A spokesmen for TV committee chairman Andrew Newman said that David’s body of work “over the last 3 years speaks for itself. To be able to keep a straight face while your brother insults the Unions that elected him, or while he pretends not to know George Galloway…genius! The brothers Miliband are infamous for going under the surgeon’s knife to perfect their art. Ed has had his septum surgically deviated to perfect his nasal twang, while David had his gonads removed during the Labour leadership election. After the May awards, David is planning to take his own brand of parliamentary “soap opera” on the road with a transfer to Broadway. Last year’s recipient for “keeping schtum”, at London’s Royal Festival Hall, was a joint award for the wives of John Terry and Ryan Giggs. This entry was posted on April 29, 2013 by Wrenfoe in UK Arts and tagged Absurdist, Award Winning, Bafta, Comedy News, David Miliband, Ed Miliband, Flib News, Flibbertigibbet, George Galloway, Goats, John Terry, Ryan Giggs, Satire, theatre, Wrenfoe.